Recipes How to Make Crispy Tempura Japanese .Japanese tempura is crisp crunchy cuisine that combines the seasoned flour dough with fresh shrimp. The flour mixture is the result of a mixture of flour, baking powder, salt, egg yolks and cold water. This dish is also called the shrimp tempura or more popularly known as shrimp flour. In the manufacturing steps, first made ​​of flour dough for later use as dye shrimp just after it entered the stage of frying. Easy enough in making this Japanese-style seafood dishes and ingredients wearing was relatively simple. Here is a recipe how to make Japanese tempura crispy step kreasikan presentation you can try at home kitchen to your beloved. Prepare the dough container and drop it in ingredients such as salt, baking powder and flour and mix evenly. Then add more dough with beaten egg and cold water or ice water. Stir briefly and do not have to flatten. Once the flour dough is finished, then combine it with fresh shrimp selection as in the following steps. Clean the shrimp and then coated with cornmeal taste. Enter the shrimp that has been given a sprinkling of cornstarch into the mixture of flour that was made earlier by dipped and held the tail. After ufang dough coated in flour mixture and cook with fried ripe and crisp. 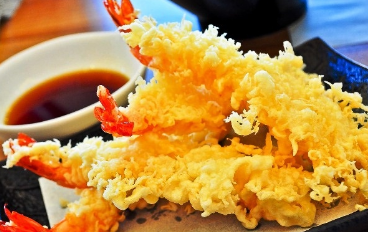 Sprinkle flour dough also enough to produce crisp crusted shrimp tempura crispy. Remove and drain and serve. Tempura Japanese seafood cuisine typical of this you can enjoy as a side dish accompanying rice dish at the dinner table. 0 Komentar Untuk "Recipes How to Make Crispy Tempura Japanese"